Food law and legislation; European Union countries. Food safety has become a major concern for consumers in the developed world and Europe in particular. This has been highlighted by the recent spate of food scares ranging from the BSE (mad cow) crisis to Chinese melamine contamination of baby formula. To ensure food safety throughout Europe, stringent food safety standards have been put in place Ã¢ÂÂfrom farm to forkÃ¢ÂÂ. At the same time, poor African countries in the COMESA rely on their food exports to the European market to achieve their development goals yet have difficulty meeting the EU food safety standards. 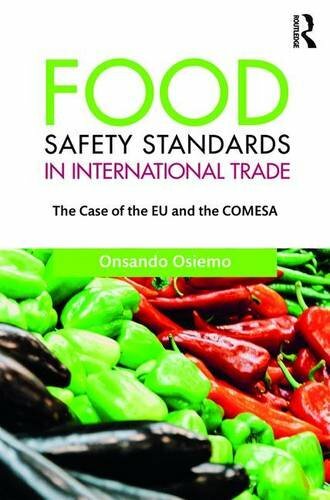 This book examines the impact of EU food safety standards on food imports from COMESA countries. It also critically examines both EU and COMESA food safety standards in light of the WTO SPS Agreement and the jurisprudence of the WTO panels and Appellate Body. The book makes ground-breaking proposals on how the standards divide between the EU and the COMESA can be bridged and discusses the impact of EU food safety standards on food imports from poor African countries.